Gisselle Rodriguez ’16, Hartley Cavallaro ’15, Natalia Morales ’17, Matthew Jamele ’15 and Lilly Bogner (left to right) participating in a simulation of the UN High Commissioner for Refugees at the 2014 National Model UN conference in New York. 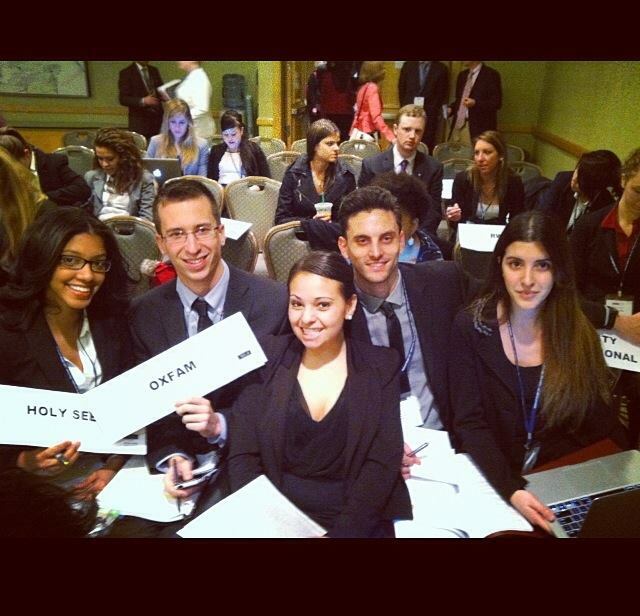 The 2014 National Model United Nations conference in New York City awakened the inner diplomat within me. I loved participating in committee, the networking opportunities, the invaluable guest lecturers and the career fair. The diplomacy skills that were locked within me are now unleashed and I will exert these skills every chance I get. This class has led me to believe that diplomacy is something that goes beyond what is written in textbooks and it goes beyond what is said in the news. Diplomacy is so much more than convincing people to agree with your ideals, it’s about working towards a better world where the “common good” is put first, where people work together to incorporate the voices of all and to actively work towards ridding the world of evil. Diplomacy is a lifestyle in which one actively seeks to make the world a better place. That is why for me Model United Nations what more than just a class, it was the portal that led me on my path to global citizenry. This entry was posted in Student Delegate Blogs and tagged diplomacy, Gisselle Rodriguez, Model UN, Model United Nations, MUN, National Model United Nations, NMUN, Pace University, United Nations. Bookmark the permalink.